The new Micro World Champion is crowned! 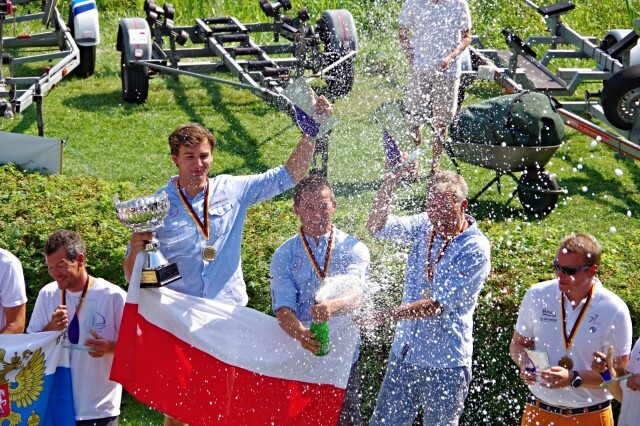 Piotr Ogrodnik and his crew Piotr Petryla and Grzegorz Banaczyk are the new World Champion 2014 in the ISAF recognized Micro Cupper Class. The team from Poland did a superb job: With 6 bullets out of 7 races the dominate the regatta hoist by the Segler-Club Gothia e.V. in Berlin-Spandau. After a strong fight RUS 39 skippered by Gennadiy Svistunov wrestled the former World Champion Piotr Tarnacki at the helm POL 77 down. Congratilation to the winner of the World Championship 2014 and many thanks to all competitors for coming to Berlin and fair racing. This entry was posted	on Saturday, July 26th, 2014 at 9:26 pm	and is filed under News. You can follow any responses to this entry through the RSS 2.0 feed. Both comments and pings are currently closed.